It’s always strange to go back to a city you’ve built and cared for after a sixth-month break, discovering the state that it’s in. I expected it to carry on without my steady hand of guidance to develop into a striving world-class city, with statues of me in every town square. And when I appear again there would be celebrations in the streets and festivals dedicated to my good work and deeds. Alas, in Cities: Skylines none of this has come true; I’ve still got a problem with sewage pipes and people hated the new park I built because it’s next to a factory. Perhaps it’s time to start all over again. When I first delved into the wonderful world of Cities Skylines, I loved the game; to this day I believe that it’s one of the best City-Sim games on console. 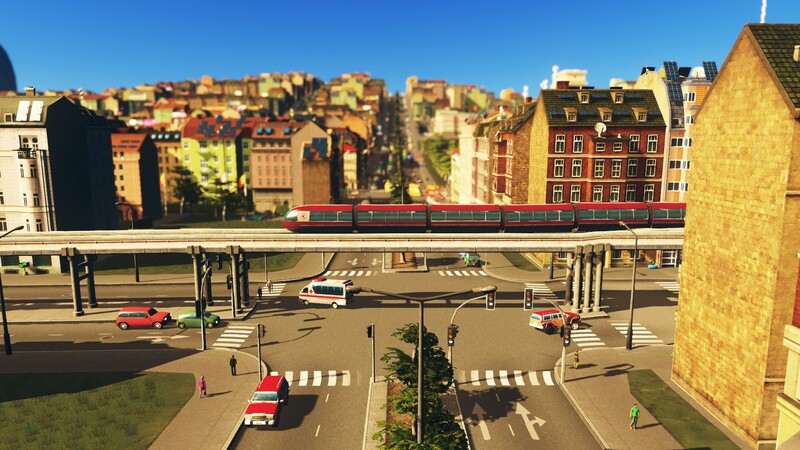 I’ve also had the chance to try my hand with some of the extra content packages that have arrived, and that is how this latest one – one focusing on the Mass Transit systems – has hit my radar. Dealing with the commuting world and how to micromanage it is something I’ve had a tiny bit of experience of in the real world, mainly as I temped as an early 20-something at London Underground for a year. My experiences don’t transfer over, but the amount of detail in running a successful transit hub is something I remember very well. Now, to start with you can take one of your old cities and add these new transport features direct in to them, improving the existing transport system by a mile. But the downside is that it does mean some demolishing and a complete rethink of your city design. When I started plowing through the original creations I’d spent hours developing, it wasn’t long before half of it was gone and chaos had ensued. It’s therefore best to start afresh. 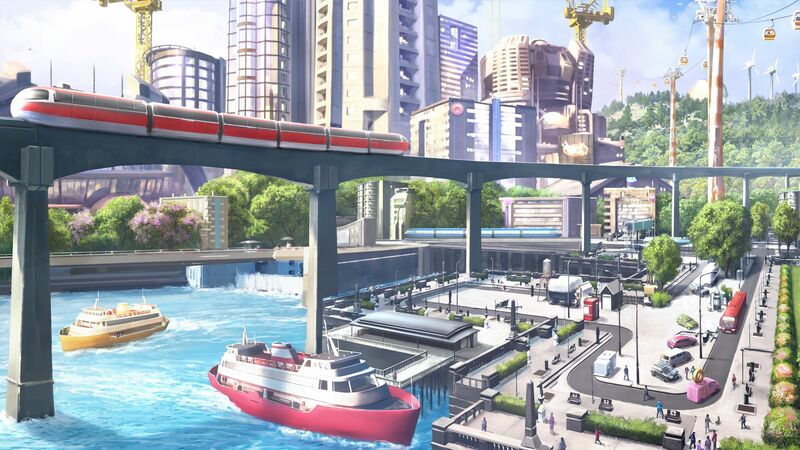 The main additions in this Mass Transit content pack are those of ferries, monorails, and blimps. Yep, sea, air, and land all combined in one lovely package. These new pieces of commuter delivery services are good too, but it is in the transit hubs that the difference is made, allowing you to connect them all to each other and ensure that the secret city planner in you feels very proud indeed. For example, let us take Dave Jones leaving home for work – he gets a bus to the terminal and then hops on a ferry across a lake. Then this is connected to the monorail that takes him to work. It’s an environmental dream, and old Dave doesn’t have to step foot near a car to travel the city. You see, it is these terminal hubs which are the arteries of your city and for me, everything else should be built around them. Again, that’s why it is best to start new with Cities: Skylines should you be tempted by this latest content pack. There are tons of new features too, like road widening to allow for monorails and putting educational messages on the blimps in the sky to make sure your citizens stay healthy. There are some new maps to play with as well… and then there are the scenarios. These put you in a position where a city is up and running but you need to solve a problem, hitting goals that involve building transport hubs and designs. This is a good starting point, at least when you are getting to grips with the mass transit systems, allowing yourself to get an idea of how things work, ironing out the kinks. There’s one specific scenario that focuses on ferries in a three lake town and another which involves tearing down buildings in order to try and fit a new transit system into an up and running city. Whatever you are doing though, these scenarios are great and fun to play. The gameplay takes a bit of getting used to and the detailed management of the mass transit system with all its interlinking aspects needs a patient hand at times. But thankfully Cities: Skylines is still a thing of great beauty. If you are a fan of Skylines, then I would highly recommend the Mass Transit DLC, especially if you are are after another challenge and want to try to create that perfect city. Personally, I’m trying once more to make my city the best it possibly can be, if only because I want those statues and folk songs sung about my great deeds. First though I need to fix that sewage problem on the east side and demolish that bloody park to stop the moaning.